Hog Roast Keighley have certainly not been stopped by this summer’s unpredictable weather. They have been out and about around Keighley bringing their wonderful spit roasted joints of meat wherever they have been needed. Keighley is a beautiful town set in the dramatic moorland landscape made so famous the world over by the Bronte sisters. Even those unfamiliar with the books know all about Heathcliff and the wild moors. The Taste the Cracklin Hog Roast team are becoming just as famous locally for cooking such tender, melt in the mouth hog roasts that it was no wonder they were asked to cater at a gala event at the towns well known Cliffe Castle a local museum and stately home. The grounds which contain a children’s park and a small menagerie consist of great swathes of sweeping tree lined lawns, and on a slightly damp Saturday afternoon were filled with families and enthusiasts of the castle. Being an all day event it was hardly surprising that as the aromas of herby stuffing mingling with tangy apple sauce and fresh roasted pork began to waft through the grounds that the hungry visitors began to follow their noses to the ovens where the talented Hog Roast Keighley chefs were working their magic. The squabbling of fractious children quickly died down as they were handed tender cuts of pork in floured buns and got busy munching. This was one of our many out door events, but the Hog Roast Keighley team also provide an excellent formal indoor service: all the headaches of hosting will be taken care of by our professional serving staff who will greet your guests and wait on tables efficiently and politely. We will also accommodate all the details from tables and table linens if required, because we take the success of your event seriously and pride ourselves on the consistent quality of service we provide. Of course not all formal events are indoors, many wedding receptions over the summer month’s favour out door marquee meals. The Hog Roast Keighley team have a history providing beautifully dressed, exquisitely catered marquee receptions with a range of inspirational menus to suit your day. These include canapés, starters, salads, desserts and of course our spectacular spit roasted pork. But we also understand that pork is not to everyone’s taste, so with our specially designed hog roast ovens we can cook various meats such as whole lamb, rotisserie chicken and even kebabs! Whatever the event we cater whether large with guests running into the hundreds or small and informal we deliver the same high level of service. However, we are so enthusiastic about what we do that if you would rather roast yourself, we can hire you one of our special ovens. We will show you how to use it and explain all the attachments so you get the very best from the oven on the day. 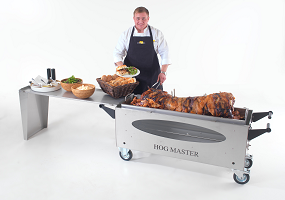 So if you’re looking for something a bit special for your upcoming event, why not give the hog roasters of Keighley a call and let our friendly staff guide you through our spectacular service.